7 Incredible Things YOU Did in 2016! See the dream. Be the impact. Feel the success. The 2016 sun has set an incredible 366 times, shining a light on all the ways your gifts to Roots Ethiopia have turned dreams and challenges into success. As we begin what will surely be another year of work to create lasting change in Ethiopia, we thought we would bring you a year in review, by the numbers. 15,000 students and their communities were enriched through Learning Resource Projects that focused on making the school learning environment the best it can be. Desks, chairs microscopes, books, shelves, concrete floors, chalkboards, libraries for public use, the list is long. The impact is broad. The local community is inspired. More than 8,600 community members received temporary food support during the months following drought-related crop failures. In the darkest of days, these food staples allowed kids to keep going to school and families to stay strong. 113 librarians and 39 science teachers received intensive training in their field to become better leaders and to improve their innovative use of local materials as teaching tools. 11 rural schools were recipients of new books in the local language(s). 6,000 students can now expand their literacy skills and love of reading. 175 students attended school with all-inclusive School Sponsorships. 40 boys and girls participated in a new sports-based program designed to develop youth leadership skills. The program includes uniforms, sports equipment, and instruction. Over 300 women and men built their own small businesses that sustain their families. 19 Self-Help Groups were in place in 14 project sites for the small business owners to increase their capacity to earn income, increase their self-confidence, and work for social change. 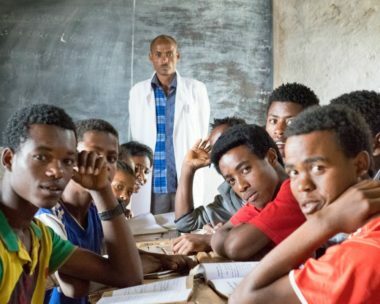 These accomplishments all began as the dreams of small Ethiopian communities. You brought the resources, and you stood strong in the face of the serious challenges that threatened the livelihoods of so many. You gave monthly, or all at once or both. Your hope for better lives for Ethiopia’s poorest families was the thread that linked possibility to progress. In 2017 we will see change, growth, and new opportunities. In partnership with your commitment, here’s to the hope for a better future for all of Ethiopia. Previous Previous post: Holiday Coffee Goodness – Our Cup Overfloweth! Next Next post: Gooooal! Shone Youth Sports Project is a Win!